The Avignon bridge is known around the world today because of the famous children’s song, Sur le Pont d’Avignon (On the Bridge of Avignon). In medieval times, it was also a well-known bridge, but not because of this song – and it wasn’t known for being danced upon either. First of all, the bridge was renowned as a marvel of construction. Twenty-two arches spanning 915 meters / 3,000 feet made quite an impression on the medieval observer. Secondly, it was associated with a miracle. A young shepherd called Bénezet heard the voice of God telling him to build a bridge across the Rhone. Then to prove that it was God, he picked up a huge boulder – so heavy that thirty strong men couldn’t move it. It was declared a miracle and the devout started making pilgrimages to see the bridge. 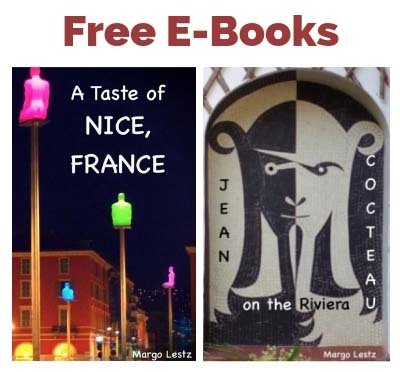 Its fame spread far and wide – throughout France and beyond. People started singing about this miraculous landmark as far back as the fifteenth century, when it was referred to in “pillow songs,” songs sung to newlyweds at midnight as they were served soup in their bedroom. It’s a mystery to me why people would go into the newlywed’s bedroom and sing about a bridge (or anything else for that matter) but I guess those were different times. Today, Sur le Pont d’Avignon is a children’s song about dancing sur (on) the bridge of Avignon, but did people ever really dance on the bridge, or did they actually sing on the bridge and dance under it? One of the first known printed versions of a song using the phrase “sur le pont d’Avignon” comes from Venice in 1503. But this song talks about one’s beloved walking across the bridge – not dancing on it. Then in 1575 another manuscript uses the phrase “sur le pont d’Avignon” but it talks about singing on the bridge. The phrase shows up in other songs from 1602, 1613, and 1711, and in all of them, people are still singing on the bridge – no dancing to be found. So it seems that up until the late 1600s, when the bridge was washed away, people only walked across, and sang upon, the Avignon bridge. It’s highly unlikely that it was ever a place for dancing. The “dancing on the bridge” form of the song that we know today, seems to have been sung only after the original bridge had been washed away, and it’s probably more of a romantic idea than actual fact. Dancing “sur le Pont d’Avignon” – A 19th century illustration. Centuries after most of the bridge had washed away. The Pont d’Avignon was not a wide bridge. At only 2.5 meters / 8 feet wide, there wouldn’t have been enough room to dance around in a big circle like the chorus of this song suggests: they all danced “tous en rond.” In addition, the bridge would have been a dangerous place to hold a dance. It was known for being very slick, and accidents involving horses, wagons, and people slipping off the bridge into the water were not uncommon. Add the strong mistral wind that blows right down the Rhone River into the mix, and we can imagine that even if people had started out dancing sur le pont (on the bridge), they probably would have ended up sous le pont (under the bridge) anyway. Starting the dance under the bridge would have been a much wiser decision. You might wonder how people could have done that, since normally, dancing under a bridge means dancing in the water – but not in this case. The remnant of the bridge that we see today in Avignon has only four of the original twenty-two arches remaining. In the middle ages, however, the bridge spanned the entire river and crossed a large island in the middle. On this island, under the bridge, there were restaurants and places of entertainment where dances were held. So, it was probably there that people danced sous (under) le pont d’Avignon and not sur (on) it. 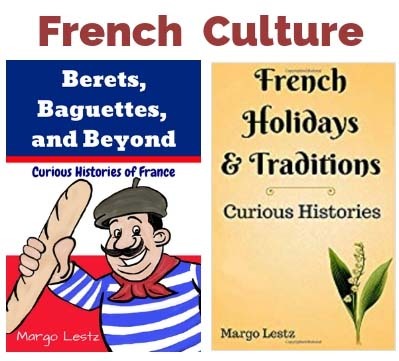 The current version of the song, which talks about dancing on the bridge seems to have come from an 18th century operetta set in Avignon and called “Le Sourd ou l’Auberge Pleine,” (The Deaf Man or the Full Inn). This musical was reworked several times throughout the years and spread the song’s fame worldwide. Then in 1843 the song was published, in a form very close to the one we know today, in a book of songs and dances for children. So, it looks like during the middle ages, people only walked across the Pont d’Avignon and occasionally sang on it. But they probably never danced on the bridge for fear of slipping and falling into the water or being blown off by the mistral wind. Most of the original bridge was long gone by the time people started to sing about dancing on it… but still, it does make a lovely song and dance for children. There we dance, all in a circle. And then again, like this. Different occupations (cobblers, laundresses, gardeners, seamstresses…) or groups of people (young boys, young girls…) all have their verses to dance to. It’s a never-ending song, as you can always add another occupation or another group of people to “fait comme ça” and keep the song going. 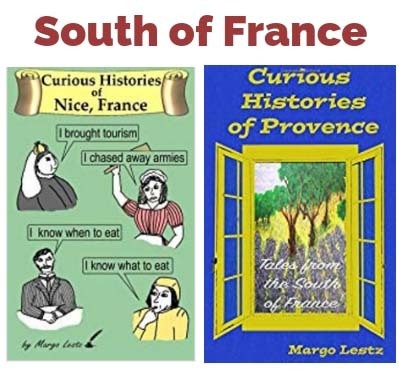 You can learn even more about the Avignon Bridge and the rest of Provence in my book, Curious Histories of Provence: Tales from the South of France. *GPSmyCity – You can take this article with you as an app with GPSmyCity. Images 1-4 in public domain. Thanks Emily, I was just in Avignon and visited the bridge – or what is left of it. It’s a lovely relic, but certainly not made for dancing – it was so windy, we almost got blown off ourselves! Such a catchy tune. Have not heard it in years, but your post will ensure it echoes around my brain all day! Thanks for sharing the story of this famous bridge. Thanks for clearing up that issue! That little ditty was my first exposure to the French language, along with Frère Jacques in Grade One. I had also read about the “sous le pont” explanation which referenced supposedly raucous parties on that island. I’m glad you didn’t get blown off during your visit, Margo! Hello! Was just in Avignon a few months ago and le pont is certainly the capturer of imaginations! It is no wonder that songs, stories and child’s play centers around this spot. Avignon is really something, no? Thanks for sharing this story and educating me on this history! It’s true that songs and saying get passed down through the ages and sometimes the meaning gets lost. I was thinking of this on New Year’s Eve when someone said we should sing Auld Land Syne – everyone knew the song, but no one knew exactly what “Auld Lang Syne” meant. A definite classic…and even though no one ever officially danced on the Pont d’Avignon, I made it a point to do just that not long ago! The pics aren’t appearing for me, not sure if it is my connection or another issue? Thanks for letting me know about the pictures not displaying. I haven’t heard this from anyone else, but let me know if you continue to have problems (not that I would have any idea what to do about it). How nice that it brought back good memories. Glad you enjoyed it.